Our bedtime routine is very routine. Jonny gives Gus a bath and I facilitate Lucille taking a shower (anyone else's toddlers demand showers instead of baths?) Then Jonny puts Gus to sleep and I put Lucille to bed. I always let Lucille pick one or two books (depending on length and how tired I am) and I thought I would share with you some of her favorites right now. For Just One Day is a cute book - where kids can wonder what it would be like to be different but take pride in being themselves too. Again not much plot but the illustrations are great. Mama I Can't Sleep is one of my favorites that she picks out. I love how it talks about the different ways in which animals sleep and Lucille and I pretend to be each animal as we read. It's fun and about sleep which makes it perfect. 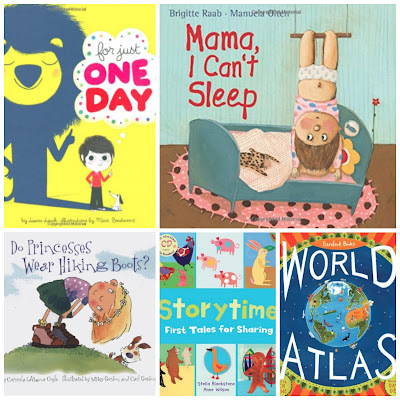 Storytime: First Stories for Sharing has a collection of stories that you are probably familiar with like The Gingerbread Man, Stone Soup, the Ugly Duckling and more. Lucille LOVES this book. She is getting her own copy in her Easter basket this year. Since its a Barefoot Book, we have a copy but it's my selling copy - so she can't read it on her own and she always asks for her own copy. Plus you get to brush up on your classic storytelling skills. Barefoot Books World Atlas might be an odd selection for a bedtime book - but Lucille loves to learn and I just let her pick out sections that she wants me to tell her about. Her favorite section is in the Oceans page and is about the Sealife food chain. So those are just a handful we have been reading lately. I'm sure it will change soon, as I'm always trying to get her to choose new ones. I'd love to hear what your reading at bedtime too! Leave a comment.